Located on the west edge of Bloomington-Normal in McLean County, Illinois, the #1 Corn and Soybean producing county in the Nation, the Interstate Center is strategically positioned at the intersection of three major Interstate highways. This is one of only seven such intersections in the United States. 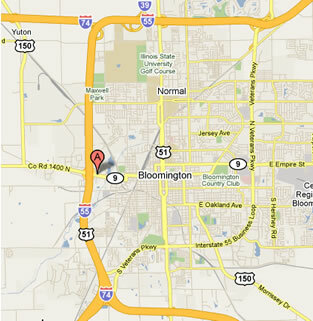 Bloomington/Normal is halfway between Chicago and St. Louis with Indianapolis close by. It is estimated that over 30 million Americans live within 300 miles of the Interstate Center and approximately 700,000 of those people can drive to the Bloomington/Normal area in an hour or less. Bloomington/Normal also has a recently expanded airport and Amtrak service to provide quick transportation from anywhere in the United States. From Chicago: Take I55 South to Bloomington-Normal, IL; take Exit 160 West on Route 9 for 3/4 mile; turn right into the Interstate Center. Estimated travel time is 1 hour and 45 minutes. From St. Louis: Take I-55 North to Bloomington-Normal, IL; take Exit 160 West on IL Route 9 for 3/4 of a mile; turn right into the Interstate Center. Estimated travel time is two hours and 30 minutes. From Indianapolis: Take I-74 West to Bloomington-Normal, IL and meet I- 55 North; take I-55/74 to Exit 160; go West on IL Route 9 for 3/4 of a mile; turn right into the Interstate Center. Estimated travel time is two hours and 45 minutes. From Des Moines: Take I-80 East to I-74 at Moline, IL; Take I-74 East to I-55, go South to Exit 160, Route 9 (Market Street). go West 3/4 mile; turn right into the Interstate Center. Estimated travel time is four hours and 45 minutes. From Madison, WI: Take I-90/94 South to I-39 at Rockford, IL. Take I-39 South to I-55 at Bloomington-Normal; take I-55 South to Exit 160, West on Route 9 (Market Street); go 3/4 mile; turn right into the Interstate Center. Estimated travel time is three hours.